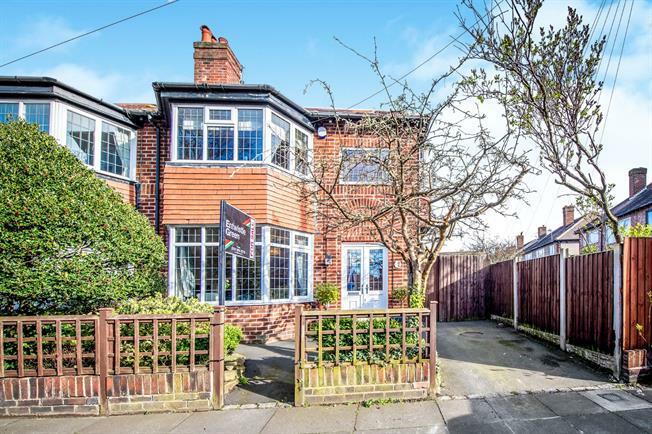 4 Bedroom Semi Detached House For Sale in Liverpool for Offers Over £300,000. Entwistle Green are delighted to present this luxurious blend of charming character and modern living. Benefiting from an extension and loft conversion this opportunity is not to be missed. The property briefly comprises of entrance hall, lounge, open plan living consisting of kitchen, second lounge and diner. To the first floor there are three bedrooms and a family bathroom. The second floor is a loft conversion with built in storage and en-suite. Externally the property benefits from private driveway, immaculate rear garden and garage. Triple aspect double glazed uPVC bay windows facing the front. Radiator and gas fire, parquet style flooring, chimney breast, original coving. Radiator and gas fire, parquet style flooring, chimney breast, original coving. Double aspect double glazed uPVC windows facing the side. Tiled flooring, original coving, spotlights. Roll top work surface, fitted units, belfast style sink, freestanding, gas oven, gas hob, space for dishwasher, space for. UPVC French double glazed door, opening onto the garden. Double glazed uPVC skylight window. Radiator, parquet style flooring, spotlights. Double glazed uPVC bay window facing the front. Radiator, laminate flooring, fitted wardrobes, chimney breast, original coving. Double glazed uPVC window facing the rear overlooking the garden. Radiator, laminate flooring, original coving. Double glazed uPVC window facing the rear overlooking the garden. Radiator, tiled flooring, original coving. Standard WC, sunken bath with mixer tap, electric shower and corner shower, wall-mounted sink with mixer tap. Double aspect double glazed uPVC windows facing the front. Radiator, carpeted flooring, original coving. Double glazed uPVC window facing the rear overlooking the garden. Radiator, carpeted flooring, shelving and built-in storage cupboard. Double glazed uPVC window facing the rear overlooking the garden. Heated towel rail, vinyl flooring.